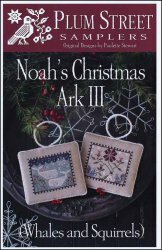 Noah's Christmas Ark 3 [D6206] - $10.00 : Yarn Tree, Your wholesale source for cross stitch supplies. Cross stitch pattern from Plum Street Samplers. "Noah's Christmas Ark 3," features two designs you can stitch into Christmas ornaments. The first design is of two whales with snow falling into the ocean. Whales get to enjoy snow too! The second design is of two squirrels standing beside blooming flowers. Look closely & you will see a small snowman beside the squirrel on the right. Stitch count 58w x 48h for each ornament. Stitched on #2239 R & R Reproductions Patriot's Brew 36ct.